Buzz Aldrin descending the ladder of the Apollo 11 Lunarilo Module. 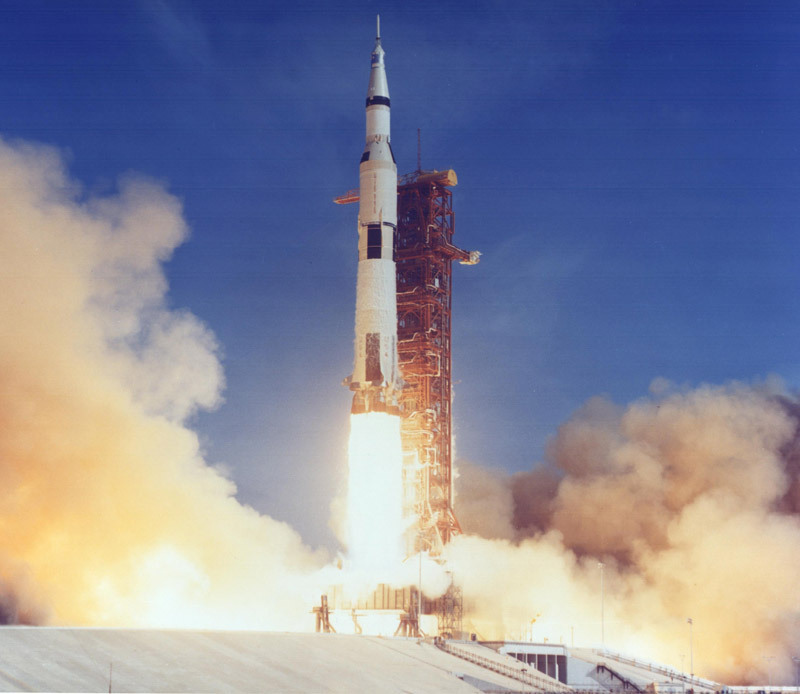 Apollo 11 was the fifth manned mission of the Apollo Project and the one that climaxed with the first manned landing on the Moon. During the final stages of the Lunar Module's (LM) 12.5-minute descent to the Moon's surface, Neil Armstrong took manual control of the spacecraft and piloted it to a suitable landing site. A warning that less than 5% of descent fuel remained gave Armstrong 94 seconds to land the LM prior to an abort and return to the CSM. As the LM came into land, dust was kicked up reducing Armstrong's visibility to a few meters. At 10 meters above the surface, the LM lurched dangerously but Armstrong continued to guide the spacecraft toward a successful touchdown in the Sea of Tranquility at 20:17:40 GMT on July 20, 1969, about 6.5 kilometers from the designated target. The astronauts donned spacesuits and were ready to step onto the Moon about 6.5 hours after touchdown. Armstrong placed a TV camera on the LM ladder, then set foot on the Moon watched live on television by an estimated 500 million people. (The only two countries that declined to telecast the moonwalk were the Soviet Union and China.) Buzz Aldrin followed about one hour later. 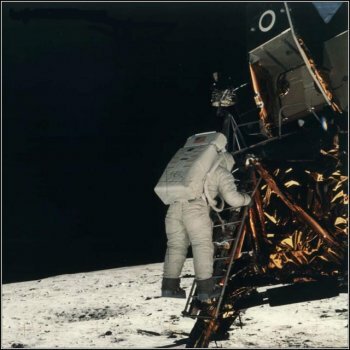 The two men set up a flag, deployed a number of experiments including a seismometer, laser reflector, and solar wind detector, gathered samples of lunar rock and soil, and took the longest distance phone call in history, from President Nixon. Upon returning to Earth the astronauts were quarantined, initially in a mobile quarantine facility aboard the recovery ship and then for about three weeks in the specially-built Lunar Sample Receiving Laboratory at the Johnston Space Center.